20:45 - Sipe, Macky2, JJ, Butterphly, Idris, Tayo, Nhlanhla and M'am Bea are the top 8 housemates. 20:37 - Ellah and Goitse are also evicted. 20:25 - Sheillah and Trezagah chat with IK on stage about their time in the house. 20:20 - Sheillah and Trezagah are evicted from the Big Brother house. 20:19 - IK tells all the nominated housemates to stand. 20:18 - Macky2 reveals that he put up Ellah because he considers her to be strong competition. 20:13 - Highlights from the freeze task messages from home are shown. 20:10 - Sipe wins last week's star meter. She has what it takes to win! 20:05 - Last week's highlights ONE campaign highlights are shown. 20:04 - The host IK introduces the show. 20:00 - The eviction show starts with a performance by Bebe Cool from Uganda. 19:37 - Goitse tells Biggie that she has been entirely her in the house. 19:32 - JJ has his nominations diary session, he says he has loved the entire experience and feels that it has been an amazing season. "Stay blessed." 19:07 - Tayo has his nominations diary session, he apologizes to any women he has offended. 18:58 - Biggie is back and nomination diary sessions start for this week's nominees. 17:20 - Nhlanhla and Sheillah sleep in the living room, Butterphly is all bright and cheery. 16:40 - Housemates enjoy M'am Bea's meal. Nhlanhla helps her clean up afterwards. 16:10 - Idris tries to nap. Sipe, Trezagah, Tayo and M'am Bea chill out with a few glasses of wine as eviction hour looms. 15:56 - Butterphly decorates Biggie's wall, Nhlanhla does his ironing and Ellah says the nerves are setting in. 15:24 - Ellah tries a few dance moves of her own in front of the mirror. 14:56 - Butterphly heads to the kitchen to help with meal preparations. Macky2 washes dishes. 14:27 - M'am Bea prepares lunch and Goitse helps out. 14:07 - JJ and Idris start dancing as well. 13:43 - Nhlanhla and Sheillah talk about housemates' dreams. Butterphly and Ellah chat with Tayo, who wants a massage. 13:24 - Housemates shop for their luxury items for the final week. 13:06 - Tayo starts dancing to the music. 12:49 - Figgie turns on the music for the housemates. 12:32 - Nhlanhla and Sheilla are still fast asleep. 12:14 - Idris asks Ellah and Butterphly's opinion of how he should wear his shirt. 11:58 - M'am Bea sings to herself as she washes the dishes. 11:42 - JJ does a few intense push-ups, while other housemates enjoy delicious-looking smoothies. 11:31 - Ellah tries to have a fashion show for Idris, as they contemplate their outfits for the eviction show. 11:07 - Housemates thank the stylists as they leave the house. 10:53 - Ellah carries on making digs at JJ, Nhlanhla and Idris and they tease her back. JJ tells her she must behave, because her mother is watching. 10:30 - The tension rises as JJ, Nhlanhla, Idris and Ellah talk about the game and campaigning for votes. 10:14 - Sipe gets a new look and jokes around with Tayo. 09:45 - Ellah is awake and getting ready for the day. 09:29 - Idris joins the others in the salon to get his hair done. 09:13 - The rest of the housemates continue sleeping, while the nominees get their hair done. Goitse and Sipe contemplate colouring their hair. 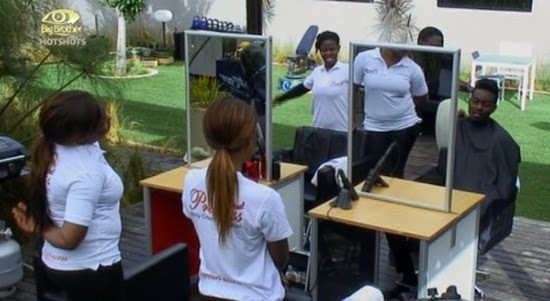 08:49 - JJ, Sheillah and Goitse join Tayo in Big Brother's hair salon. 08:30 - Nominated housemates start getting their hair styled for tonight's eviction show. Tayo is first in the chair. Tayo u have disrespect African women. Now, u have shown real colour. Tayo forget about money. Simply b coz of Ur arrogance. Why u hate Nigerian dude. Stupid southern eastern hatred. You give yourself too much credit dude. Nobody hates you, that emotion is just too expensive to give to anyone!! You are the loudest here, you talk too much - shut up and just campaign for your rep.! Don't threaten us with hate! It's all in your imagination, nobody hates Nigeria! You are just paranoid! You can hate anyone if you want to, we are just stating our case: nobody hates you, you can continue to hallucinate! Stop cracking ur skulls, Idris is the winner.